Chlorine Dioxide is a highly potent biocide known to be effective over a wide pH and especially effective against Legionella. Chlorine dioxide (ClO2) is a highly potent, fast acting bactericide and viricide that is effective at concentrations as low as 0.1 ppm. Chlorine dioxide does not form halogenated by-products, like toxic THM’s, and is effective over a wide pH range in both hard and soft water. 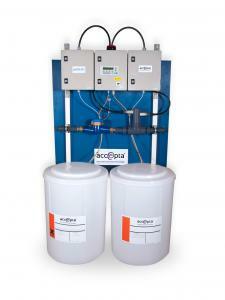 It will eliminate both planktonic and sessile bacteria, disinfect surfaces and rapidly destroy problematic biofilm. These properties make it ideal for use in a wide range of water sterilisation, disinfection, environmental hygiene, industrial and process water treatment activities. It is particularly popular in the food and beverage sector, because it doesn’t cause taste or taint, and for the treatment of water in buildings to prevent Legionnaires’ Disease. Accepta’s range of advanced technology chlorine dioxide products delivers fast-acting, superior microbiological control in a safe, convenient form. Accepta are also suppliers of chlorine dioxide dosing systems and generators suitable in a wide range of small and large treatment applications. Please speak to us today and ask about our dosing systems and advanced ClO2 chemistry.